Более полная информация в разделе "ЩЕНКИ"
MORE FULL INFORMATION in "PUPPIES"
25.10.09 OUR AMERICAN AKITAS WE'VE AVAILABLE PUPPY НАШИ АМЕРИКАНСКИЕ АКИТЫ: У НАС ЩЕНКИ!!! НАШИ АМЕРИКАНСКИЕ АКИТЫ: У НАС ЩЕНКИ!!! 1.10.09 3 d month old puppies 3х месячные щенки "РУСИЧ"
Success of our greyhounds on "Russia -2009' // Успех наших грейхаундов на "России - 2009"
Great success of our greyhounds on "Russia -2009" // Успех наших грейхаундов на "России 2009"
Our Rus, Pol, Hung. CH, Club Winner, Club CH. Epic Fundamental - has get his 4-th CACIB, CAC, Best male, BOB, RKF CH . CACIB SHOW "RUSSIA 2009" "РОССИЯ - 2009"
RUSICH ZOLOTOY isn't available now, as has get a new wonderfull home !!! from our BERKUT RUSICH DE HERMITAGE DE'EOLE and RUSICH BEERJUZA. Great victory - Zhakan - new European Champion!!! Жакан -Чемпион Европы! NOW ZHAKAN is INTER.CHAMPION on COURSING !!! СЫН НАШЕГО НЕПОБЕДИМОГО САПФИРА - ЖАКАН - ЧЕМПИОН ЕВРОПЫ, CACIL ! 23.05.09 NATIONAL BORZOIS CLUB SPECIALITY - 2009 -SUCCESSFULL SHOWING of RUSICH BORZOIS!!! 23.05.09 MAIN BORZOIS CLUB SHOW of YEAR - NATIONAL BORZOIS CLUB SPECIALITY - 2009 SUCCESSFULL SHOWINGS of RUSICH BORZOIS!!! 16.05.09 RUSICH SAPFIR'S SON - ZHAKAN - CACIL , WINNER of INT.COURSING in MOSCOW!!! 16.05. and 17.05.09 - 2 days of victories for RUSICH VOLSHEBNITSA!!! ПОБЕДЫ РУСИЧ ВОЛШЕБНИЦЫ !!! 18.04.09 GRAND-PRIX "SPRING PETERSBURG" ГРАН-ПРИ "ВЕСЕННИЙ ПЕТЕРБУРГ"
05.04.09 CAC NATIONAL SHOW 'LIDER-PRESTIG-2009"
15.03.09 МОНОПОРОДКА РПБ SPECIALITY & NATIONAL ALL BREED DOG SHOW "MOSCWA ZLATOGLAVAJA -2009"
04.03.09 NEW " E"- RUSICH BORZOIS LITTERS !!! 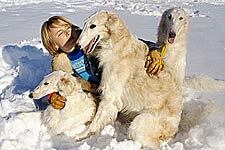 НОВЫЕ "E" - ЩЕНКИ РУССКОЙ БОРЗОЙ "РУСИЧ"
24.02.09 NEW " ZH"- RUSICH BORZOIS LITTERS !!! НОВЫЕ ФОТО "Ж" - ЩЕНКИ РУССКОЙ БОРЗОЙ "РУСИЧ"
NEW FOTOS of "ZH" - RUSICH BORZOIS LITTERS НОВЫЕ ФОТО "Ж" - ЩЕНКОВ БОРЗЫХ "РУСИЧ"
11.01.09 NEW " ZH"- RUSICH BORZOIS LITTERS !!! НОВЫЕ "Ж" - ЩЕНКИ РУССКОЙ БОРЗОЙ "РУСИЧ"